SUMMARY: The approximately 9 million low-income elderly and disabled individuals who are Medicare and Medicaid dual eligibles are poorer and sicker than Medicare and Medicaid beneficiaries as a whole, and consequently account for disproportionate shares of Medicaid and Medicare spending, according to a study by the Kaiser Commission on Medicaid and the Uninsured. With a long history in serving Medicare beneficiaries, SCAN Health Plan has a multi-pronged, strategic approach to reaching dual eligibles based on the specific needs of the member. 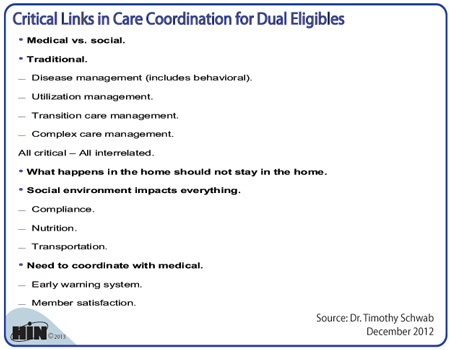 We wanted to illustrate SCAN's five critical links in care coordination for the dual eligible population. Click here to see a larger, printable version of this table. Dr. Timothy Schwab, chief medical officer of SCAN Health Plan. "The critical key in care coordination is developing a link between the social and the medical. It's incorporating the traditional things like disease management, utilization management, transition management and complex care management. All of these are very critical and interrelated. Critical in the dual eligible population is what happens in the home and a model can help identify that. The social and home environment impacts everything  the compliance with medications and the medical advice of the physician. It deals with nutrition and transportation issues. If the patient lives in an area where they have no access to transportation, you have to be able to provide them with a means of transportation." During this webinar replay, Dr. Timothy Schwab, chief medical officer of SCAN Health Plan, shared his organization's strategic approach to serving the dual eligible market. Care Coordination for Dual Eligibles: A Results-Oriented Approach is available from the Healthcare Intelligence Network for $129 by visiting our Online Bookstore or by calling toll-free (888) 446-3530.